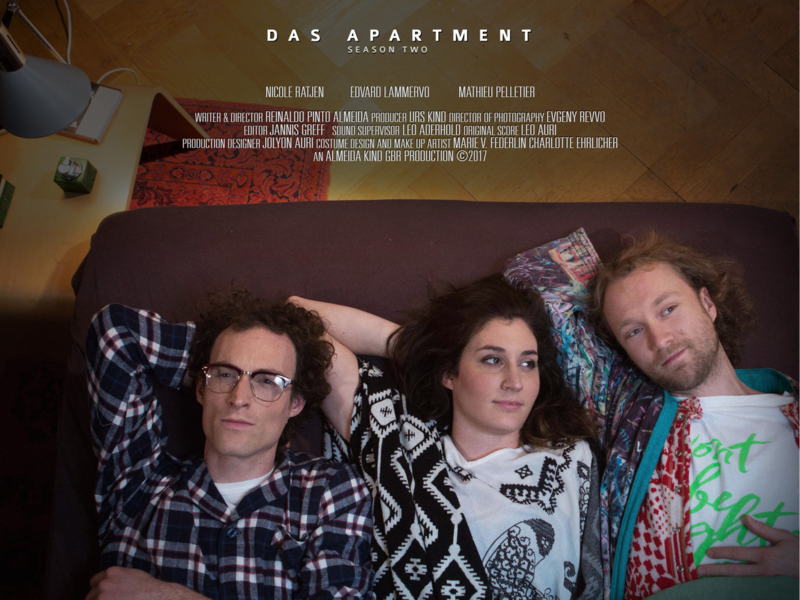 In the second season of the comedy series das Apartment the Berlin flat share, goes through short love encounters between Lenni and Gülden. Rachel decides on how and where to spend her time and Chris needs to find out whether working for an NGO is his true calling. We also get to know Rachel's German teacher and Chris potential boss and last but not least Rachel's new fling. And as always we get to spend some fun home-moments with the three international flat mates, including some eccentric house parties. Rachel is in Lisbon and Lenni and Chris don't really know how to deal with the possibility of her leaving. Out of boredom and with the help of some weed, Lenni decides than they can become Rachel in her absence. Lenni is on a date with Gülden which leads them into the apartment. Whilst Lenni is being himself Gülden seems less and less interested in him. An embarrassing next morning is making life tougher for Lenni than he could expect, as he realizes that he likes Gülden more than his philosophy would allow. Chris has a job interview at an NGO. He meets Maria the eccentric director of the organization who confronts him with making a life choice rather than just getting a job. Back at home Chris gets some advice from his flatmates Lenni and Rachel. But at the end of the day he needs to make up his own mind. Rachel has decided to learn German. Unfortunately her teacher Ralf is a bit too weird for her to be enjoying his lessons. As she is getting mixed signals from Ralf after a class she decides that she needs to explain him her notion of privacy. Chris goes to see an exhibition by Gülden's gallery where he meets Rachel. While he isn't too impressed by the artwork he notices Rachel flirting with a guy called Sven. Not wanting to be the third wheel he goes back home, where he finds Lenni and his friends partying a little bit harder than he would have expected. The next morning he realizes that he isn't really happy about Rachel dating Sven due to his capitalistic worldview, and seeks to confront Rachel.